Forging(Hada): Forging is fine Ko-Mokume. Fine steel covers with thick Nie sparkling hard metal granules Ji-nie on Hira-ji surface. Darkish thick Mokume-burl pattern of Nie so called Chikei activity wells out from steel. Temper(Hamon): Hamon is fine Nie hard metal granules base, starts with short slope of Yakidashi on base, undulating hamon pattern of gentle waves, flamboyant Gunome, Box-shape, tassel-shaped clove outline to form like surging big waves where entire temper varies in shape and height. Some of quenching temper splash onto Hiraji surface Tobiyaki to form like a sparkling star, crescent moon or flying wild geese. The interior of temper is filled with mist-like crystallize area deeply with Ashi and floating YOU activities, thick lines of Nie-Sunagashi and bright curved threadlike Kinsen areas. Deep sparkling Nie accumulates on the gorges of Gunome-outline and a pair of round head forms likely "eyes of horsefly" so called "Abunome". The entire temper gives off extremely vivid and bright impression. Temper of tip(Boshi): Boshi forms straight Suguha and medium circle turns back gently. Tang(Nakago): Nakago is in UBU original. One peg hole. slanging left "Katte-sagari" filemarks. Back ridge of Nakago is flat with Katte-sagari filemarks and V-shaped "kengyo" heel shape. 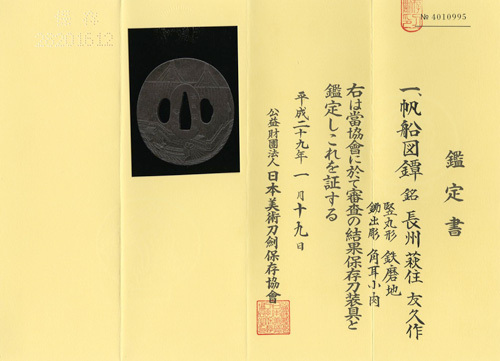 The signature in front is ten character that starts from the place of work Hizen-ju, the official district title of Musashi-no-kami, name of clan Fujiwara and the smith name MASANAGA 肥前住武蔵守藤原正永. Nabeshima clan in Hizen domain (now Saga pref.) had produced a considerable number of sword makers during Edo Shinto period that ranked with large city of Edo and Osaka. There came from large numbers of orders either from the successive Shogunates or high class Samurais from the whole country. The MASAHIRO 1st gen. 初代正廣, initial name Sadenjiro 佐伝次郎 was a son of YOSHINOBU 吉信. Both 1st and 2nd gens. named themselves MASANAGA 正永 in the beginning. It is well-known that that they played ghost-makers for the head TADAYOSHI 忠吉 family to assist the 2nd generation TADAHIRO 近江大掾藤原忠廣 very capably. The subject sword maker 2nd gen. MASAHIRO 正廣 was born in Kanei 4 (1627) a son of 1st gen. MASAHIRO 正廣, childhood name Yashichiro 弥七郎 then succeeded name of Sadenjiro 佐伝次郎 from his master father when he met with his coming of age 18 years old as Genpuku ceremony, initial smith name MASANAGA 正永. Manji 3 in 1660, at his age of 34 years old, he first time enjoyed the tile of Musashi-daijo 武蔵大掾 then updated to Musashi-no-kami 武蔵守 title next year, Kanbun 1 (1661). After the death of his master father 1st gen. MASAHIRO in Kanbun 5 (1665), he again came up the Kyoto along with his son (later 3rd generation) in order to enjoy an official district Kawachi-no-kami 河内守 title and changed his smith name to MASAHIRO 正廣 at the same time. After all it is unusual that he had changed his title 2 times and enjoyed as much as 3 district titles granted from the Imperial Court within 6 years. He has left incomparable flamboyant works of brilliant Hamon like this example from Sōshu tradition and his works won the highest praise from feudal lord Nabeshima clan and admired in his innovative pattern of his talented Hamon as "bears resemblance of Mt. Fuji, Star or flying geese" in the book of Shinto Bengi 『新刀弁疑』. 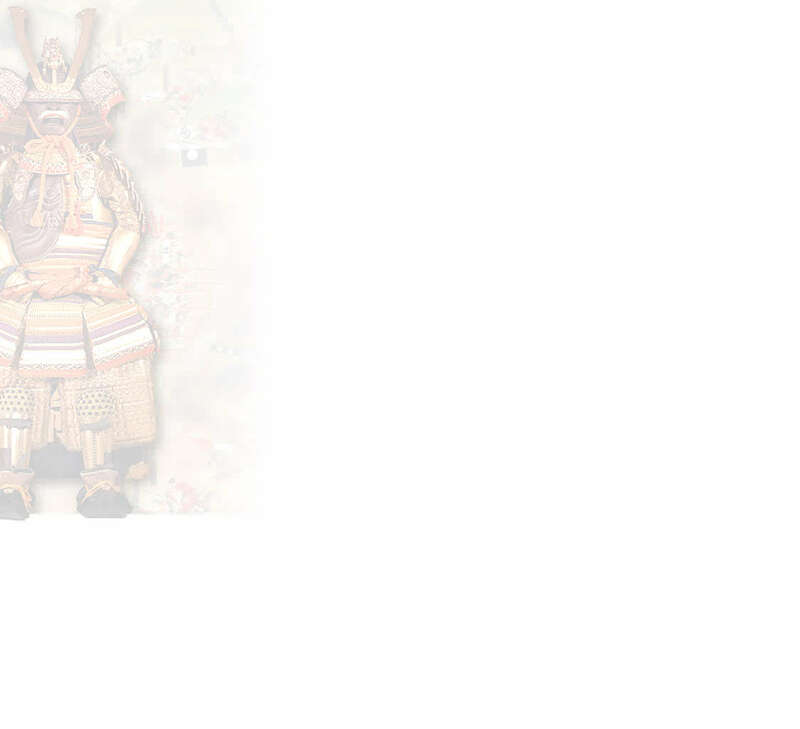 Passed away Genroku 13 (1700), was 73 years old. The subject heroic katana is full of vigor, shows a notable feature of the age during Kanbun (1661-72) period - solid in hands, shallow in curvature, long blade with an elongated kissaki of kanbun-shinto style. Steel forging mark shows conspicuous fine Ko-Mokume with most supreme sparkling Ji-nie glitter that generates superior Chikei activity. Hamon is an extravagant undulating pattern of big surging waves and Gunome or Choji tassels outline with rich activities of Nie to bear a close resemblance to the ancient work of Sōshu tradition. 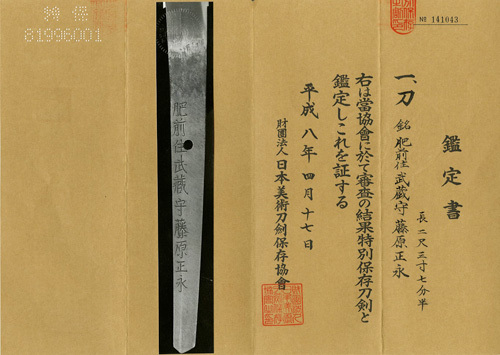 The subject katana proves that MASAHIRO had taken the leading part in developing sword making for the branch Hizen schools and had laid the foundations for the later prosperity of the Hizen swords - brothers families of MASAHIRO's 正廣 and YUKIHIRO's 行廣. 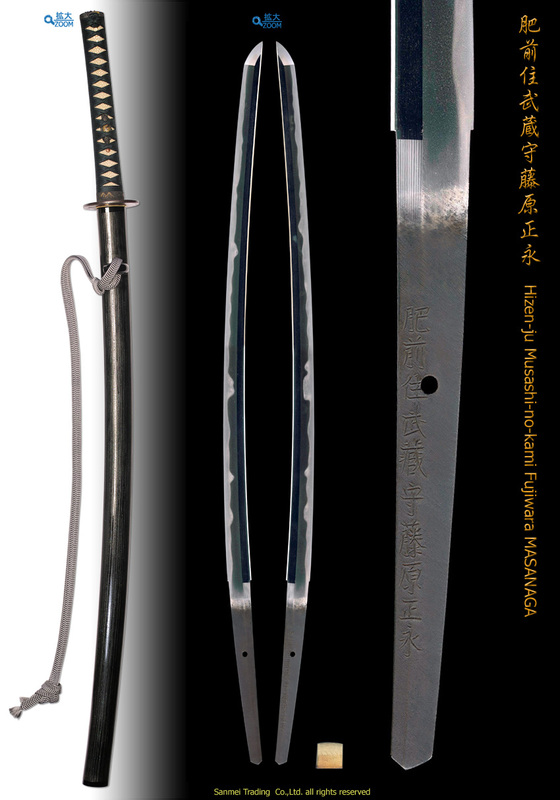 This katana is one of the most superior masterpieces of 2nd gen. MASAHIRO 正廣 from 1661-65 and won Tokubetsu Hozon award in Heisei 8, (1996).